Born in Russia, Ekaterina Ermilkina now lives and works in New Jersey. She grew up in the beautiful city of Yalta on the North coast of the Black Sea, where in 1985 she enrolled as a student to the School of Art of F.Vasiliev, graduating in 1991. After her first introduction to fine art in Yalta, in 1992, Ekaterina Ermilkina moved to Saint Petersburg, Russia. In 1998 she received her MFA from State Art and Industry Academy. The unique beauty and rich culture of the city inspired her to paint cityscapes. In late 2005, Ermilkina moved to the U.S. Her works has been presented in various solo and group exhibitions and have been collected throughout the United States, as well as Canada, Germany, France and Russia. Ekaterina Ermilkina’s original abstract fine art paintings are created using a skillful combination of applying and removing oil paint with a palette knife on canvas. Her inspirations are the expressionistic magic skylines of big cities like Manhattan, Philadelphia, or Chicago filled with colorful skyscrapers. The urban scenic views are abstracted and rich with vivid and textured layers. Ermilkina’s emotional architectural patchwork and mosaic cityscapes radiate a life of balance and positive energy. Artist Statement I cannot remember a time in my life before I was a painter. Architecture first drew me in and became a subject of my painting while attending graduate school. During my subsequent travels throughout Europe, I was awakened to the history that buildings carry with them, and the way past and present are in dialogue with each other within a structure. When I first came to the U.S., it seemed that everything about the architecture was completely new—and, by extension, the sense of history and culture, and what the buildings had to say. It was impossible to continue working in quite the same way. The experience of seeing skyscrapers for the first time had an enormous imaginative impact, and the effects continue to reverberate in my work, both in its content and in my evolving technique. The modernist style of the buildings seemed to demand a more modernist artistic approach, and I was inspired to create the “Urban Series”. Here, my paintings began to be more abstract. 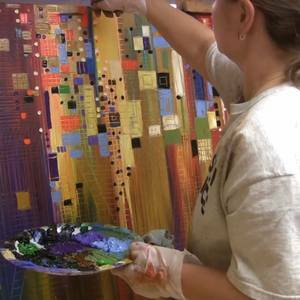 My medium is oil on canvas, and working with color and texture is an ongoing exploration. Modern pointillism has been a revelation for me. Using a palette knife, I apply distinct dots of color and build a pattern, which ultimately is only seen as a pattern when the dots are blended in the eye and mind of the viewer, from a distance. Stippling is very time-consuming, but allows such subtle gradation of color, depending on how far apart the dots are placed, and creates great depth and dimension. I love how these techniques can be so expressive; how the textures allow me to convey, for example, the inner life of a building. Capturing the interior nature of subject matter that may seem, on its surface, prosaic and everyday is what I am after.